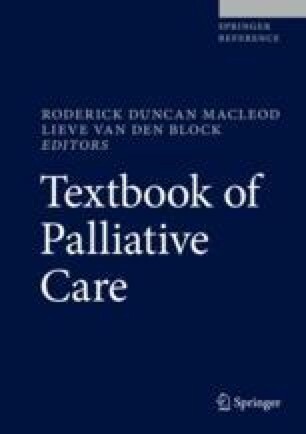 Palliative care in endocrine diseases is similar to palliative care in any other disease. The aim will be to reduce the symptoms, avoid short-term complications and improve or maintain the quality of life by minimal interference and with least inconvenience to the patient. Palliative care in diabetes mellitus aims at avoiding hypoglycemia and symptomatic hyperglycemia, and not necessarily achieving euglycemia or postponing/preventing chronic complications of diabetes. Palliative care in thyroid disorders aims to help the patient remain asymptomatic in both hypothyroidism and hyperthyroidism and not normalizing the TSH. Palliative care in all other endocrine diseases like Cushing’s disease, pheochromocytoma, pituitary tumor, insulinoma, and hyperparathyroidism is also mostly minimal medical intervention to alleviate symptoms and improve quality of life. Replacing endocrine deficiency as in Addisons disease, hypothyroidism, hypocalcemia due to hypoparathyroidism is important and similarly managed to any other endocrine deficiency.